Issued 1st May 1933. The stamps simply indicate that the correct tax has been paid on each packet of cigarettes, which is why no value is shown. The tax payable may well have changed during the life of this stamp. 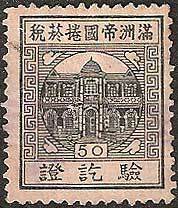 The lower panel reads - 驗訖證 Certificate. The stamps were lithographed on un-watermarked white paper. 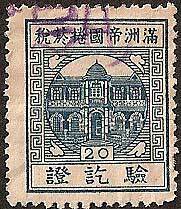 According to information shown in Encyclopedia Japanese Philately at first these "inspection stamps" were printed by the Japanese Printing Bureau, afterwards they were printed locally. 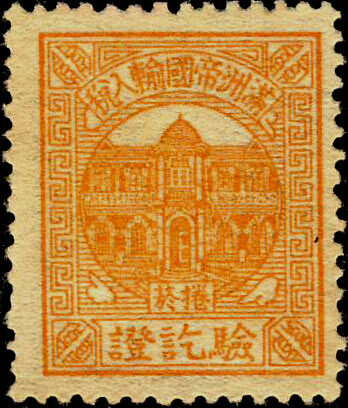 All stamps show a picture of Hsinking Palace. 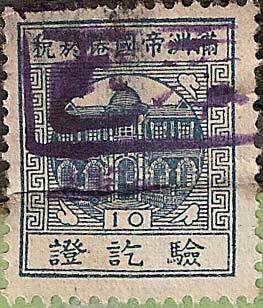 The second example shown is overprinted with the character 新 (zin) meaning "new". Issued in 1934. These revenues were based upon the quality of the cigarettes and the stamps simply indicate that the correct tax has been paid. This is why no value is shown. 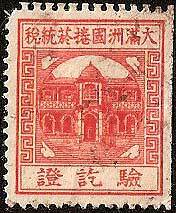 Rarely stamps have been found with a monetary surcharge in red or black (see below), the reason for this is unclear. The upper panel reads 滿州帝國 Empire of Manchuria 捲菸 Cigarette 稅 Tax. The lower panel reads - The lower panel reads - 驗訖證 Certificate. The colour of the stamp determines the class of domestic tobacco used - 1st Class red, 2nd Class light blue, 3rd Class brown, 4th Class indigo, 5th Class blue, 6th Class green, 7th Class purple - the numerals indicate the number of cigarettes in the wrapper. It may be that all grades include a 5, 10, 20 or a 50 value depending upon the number of cigarettes per pack. 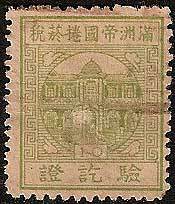 The 1932 stamp is headed "Great Manchukuo", this issue is simply headed "Manchukuo". (the first character reading right to left differs). 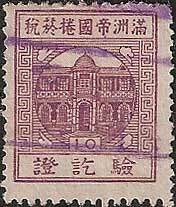 Purple overprints are often town and city names. The stamp is engraved on watermarked (design unclear) white paper details of printers and designers are unknown. Click here to see remnants of these Cigarette Revenues in use. Issued in 1936. A tax paid stamp, simply indicating that the correct tax has been paid. This is why no value is shown. The small lower panel reads 捲菸 Cigarette. The large bottom panel reads 驗訖證 Certificate. There is only one version of this stamp and the use appears to be limited to all imported cigarettes. 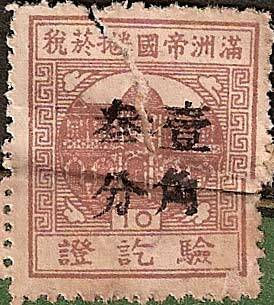 The example below is mint and has no gum, this may be an indication that the stamps were supplied without gum. The stamp is engraved on un-watermarked white paper details of printers and designers are unknown. 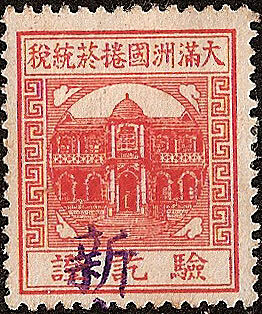 The stamp features a picture of Hsinking Palace.